Today, creating and processing stereo video typically employs approaches based on disparity maps. The disparity map is the basis for 3D video conversion and is also critical for changing characteristics of the stereo sequence like color correction, parallax change and the rest. There is no rational way to keep the real depth while shooting in stereo so the only practical way to obtain disparity maps from a stereo sequence is to analyze the displacement of corresponding areas in the left and right frames. The smaller the object shift between one view and the other, the closer the object is to the zero level (the depth value at which the area of the screen is situated). The YUVsoft Depth from Stereo plugin for The Foundry Nuke uses such an approach to automatically obtain disparity maps from a stereomate video. 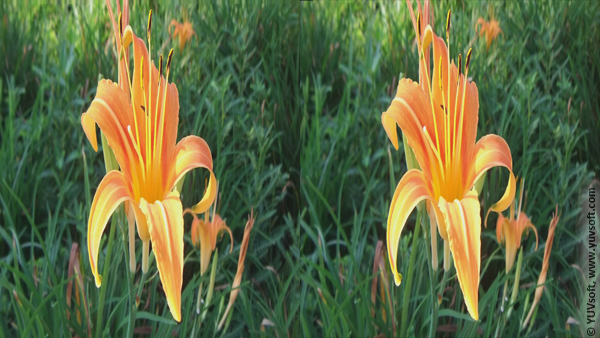 One of the key areas in which disparity maps obtained using Depth from Stereo are useful is stereo-to-multiview conversion. The algorithm yields better results for two maps (one for each view) than for only one map. A similar problem is a parallax change. New views are generated using the displacement taken from disparity maps for each of the initial frames. 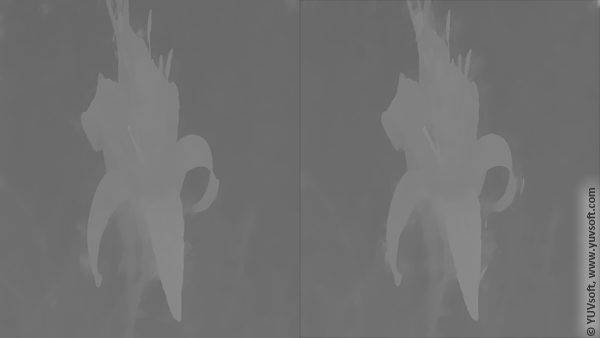 Also, these disparity maps can be supplied to the Stereo Generator plugin to improve the quality of the stereo if you have an original 2D footage without depth maps for it. Various options are available for adjusting the results of Depth from Stereo processing. The Depth map multiplier option determines the range of values in the depth map. The higher the value, the bigger the difference between shades of gray for the nearest and farthest objects. Spatial filtering and Temporal filtering increase the stability of areas having the same depth—for a single frame and throughout the whole sequence, respectively. All processing is performed automatically; the user need only select the filtering mode, where applicable. The input for Depth from Stereo is the source stereomate sequence. 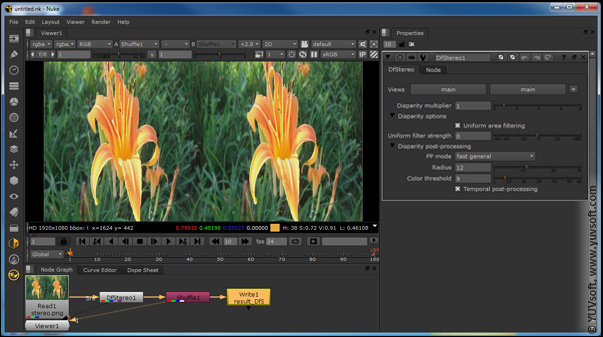 The software then yields the disparity map video sequence.